Do you have some bad listening habits that you want to eliminate? Do you want to improve your ability to receive what animals want to communicate? Are you ready to expand your levels of understanding their messages? 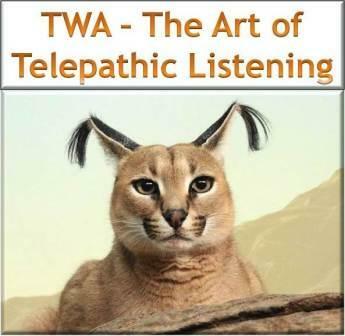 TWA - AOL (Art of Telepathic Listening) is the course for you if you're ready to take your telepathic listening skills to new levels of receptivity, understanding, and insight. Your animals want you to hear their messages more clearing and with greater reverence. EXPAND your abilities to listen telepathically. ENHANCE your telepathic communication through a spiritually expansive approach. LEARN how to use your body posture and breathing to become quieter inside and enhance your listening. RAISE YOUR AWARENESS of how you receive telepathically. LEARN how to respond neutrally to messages to improve trust with an animal. ALIGN yourself with the 10 qualities and skills of a good listener. PARTICIPATE in a guided meditation called “The Mirror of the Mind” and other exercises. DISCOVER how to stay in non-judgment while communicating telepathically with animals. IMPROVE your overall listening skills. 5 group 90 minute teleclass sessions. Opportunities to practice at home and get questions answered during class time. Saturdays: 11 a.m. to 12:30 p.m. or so, EDT. Use New York City for Eastern Time. play, and practice with the recordings.